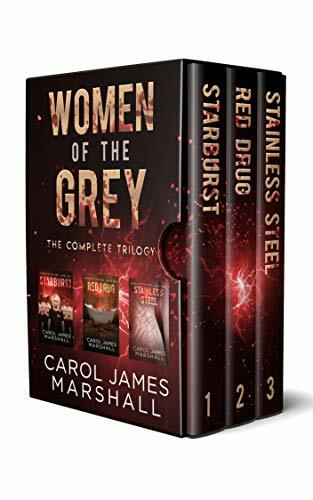 The Women of the Grey trilogy by Carol James Marshall is the complete story of Lisa, a strange woman who is sent from the sanitized all women-controlled world known only as “The Grey” on missions to further her strange race. Lisa is one of many, all the same, and none different, but for Lisa, this is not enough. The more she is outside the sanitized world controlled by the cruel Mothers, the more she learns of the deception that has been perpetrated. Lisa becomes obsessed with exposing the Grey and all who dwell within if it’s the last thing she does. While the trilogy follows Lisa as the primary character, she is not the only woman to be featured and just like Lisa, each one goes through their own trial, suffering and eventual rebirth for better or for worse. Told primarily from a first-person perspective the entire trilogy unfolds through the eyes of the various other characters both within the mysterious sanitized environment of The Grey and in the outside world. While the story has a definite end point, I also love how Marshall has left a crack on the narrative to possibly revisit those who remain in shorts or upcoming one-off novels if she so desires. I previously read all three of the books in the trilogy from the author while the stories were being individually released and, let me tell you if you have just picked this up and are not familiar with the series, be glad that you did. I was so cliffhung after each book, the wait for the next one was long. The Women of the Grey trilogy is part Science Fiction, part Horror, with a dash of sinister thrown in for good measure. If you are a fan of anything creepy or bizarre, this trilogy would be a good read for you. If you are interested in my individual reviews of each book you can use the links below.